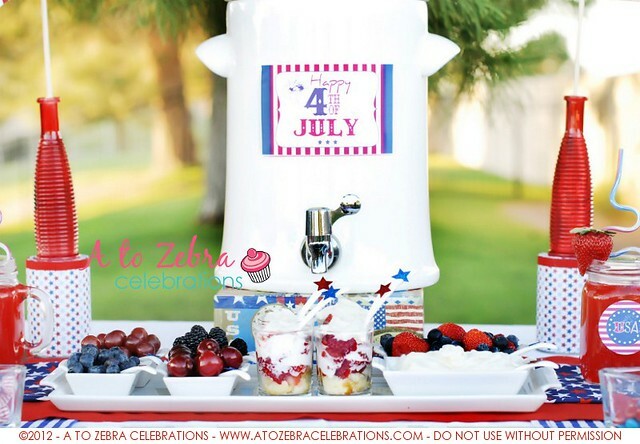 Are you wanting to celebrate 4th of July in style, but on a small budget? 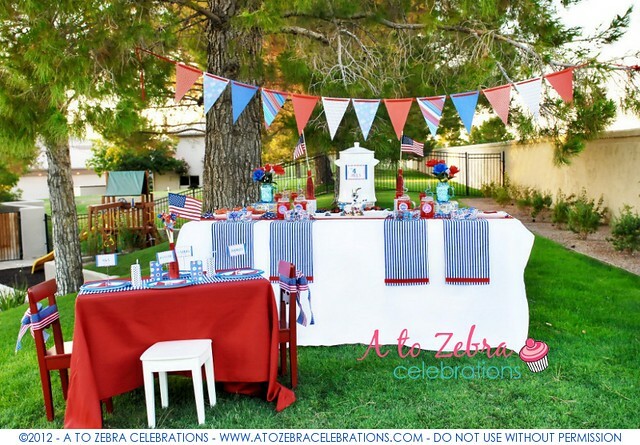 I was excited to challenge myself and figure out how to style something that would “WOW” your guests regardless of how much you spent on the party. 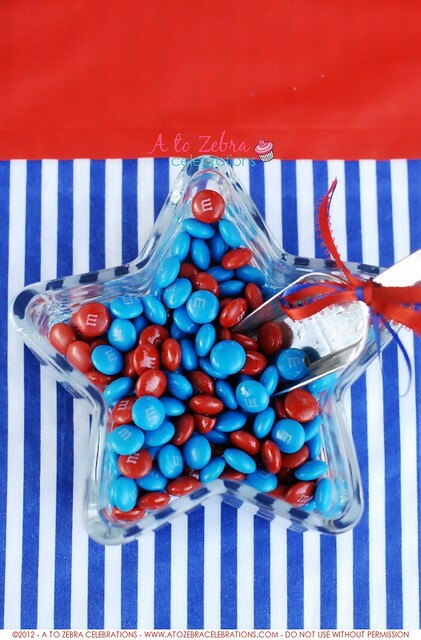 I think you’ll love these ideas! I went around my house and gathered all the things I could use to set up my tables. I used a 6-ft table with a white tablecloth. 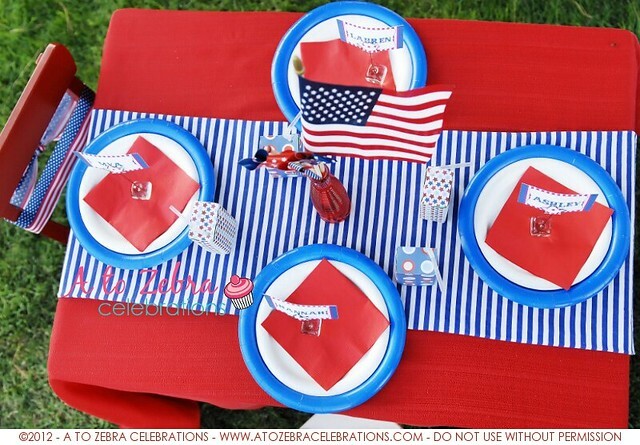 You can find tablecloth at Target for $16.99. I use mine very often. I am not good at sewing, but I can make simple table runners and napkins as you see displayed on the tables. The blue and white stripes fabric is from Goodwill ($.99 cents for all of it). 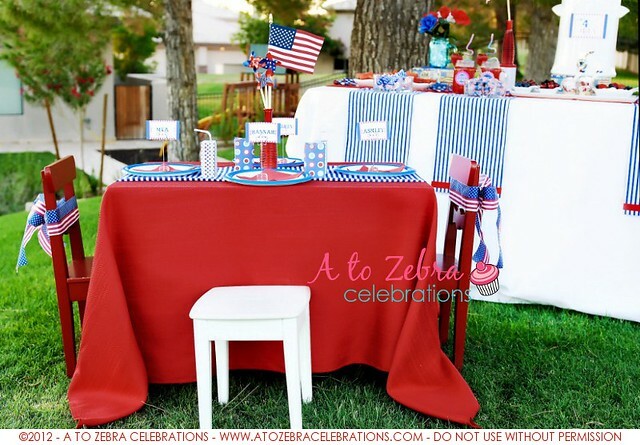 The red and stars table runners cost me about $20 in material, but you will have leftover material for other use. 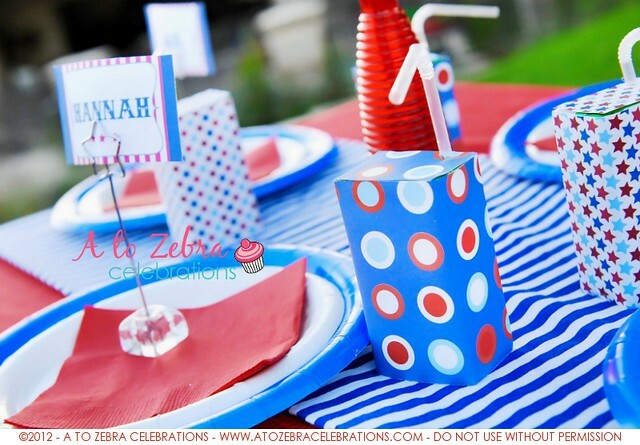 A cake, cupcakes or dessert does not need to be the focal point in the middle of the table. 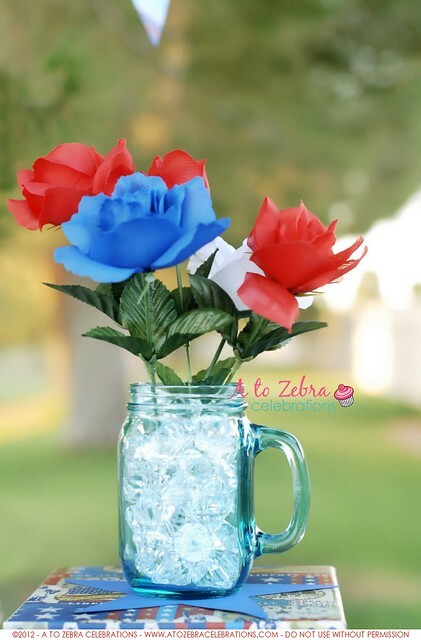 I used my white beverage jar to make it my centerpiece. This jar is from Linens & Things. Do you remember that store? I’ve had the jar for over 8 years! 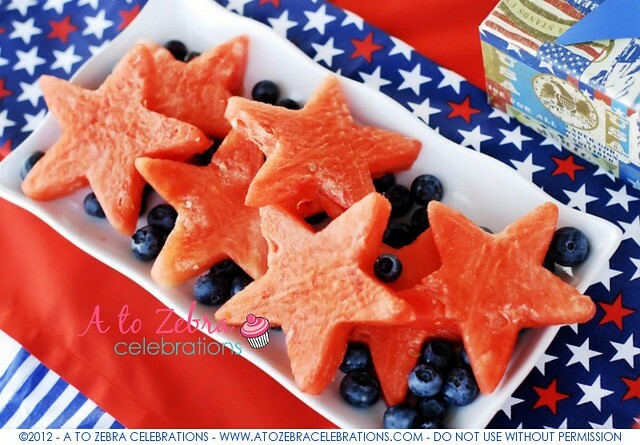 I wrapped 2 cans of soup with stars scrapbook paper to set the little red jars on top. I decided not to buy desserts such as cookies, cupcakes, or cake pops because it can get very expensive. I bought summer fruit and it was way more affordable. 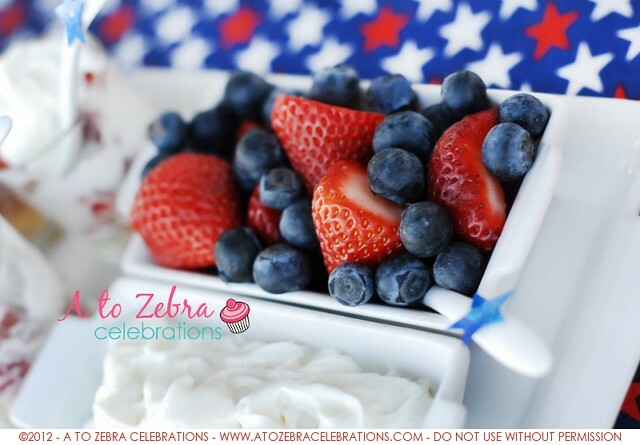 Everyone loves fruit, right?! 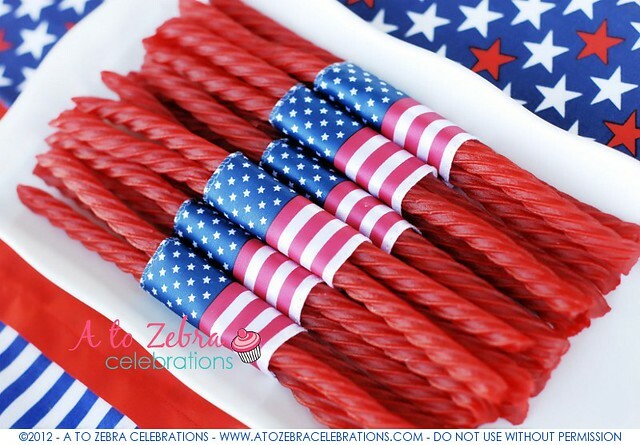 I bought one bag of “red vines” ($1) and wrapped them with flag ribbon I purchased at Hobby Lobby for 90% off last year. It helps to buy things after each holiday. You get the best deal. 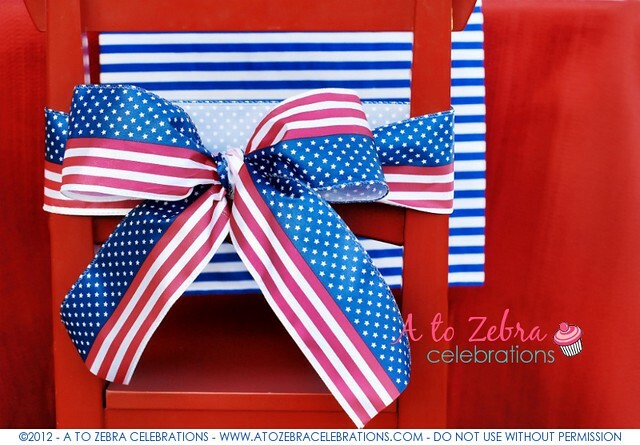 The patriotic boxes where the beverage jar and flowers are setting on are also from the 90% isle last year. All the mason jars are from Goodwill. I spent $3.50 for all of them. I make my own pennant banners with scrapbook paper. 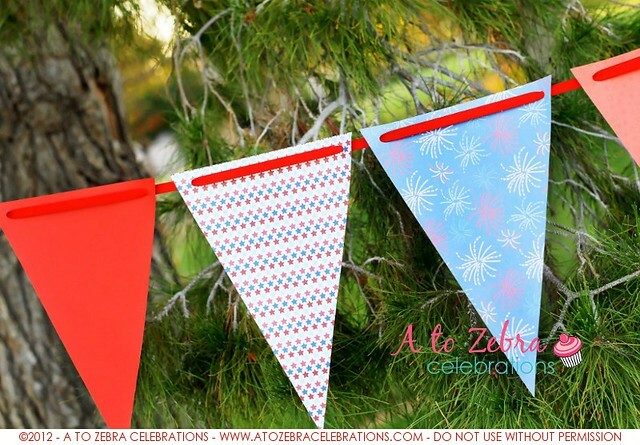 If you don’t want to make your own, you can purchase them in my etsy shop at A To Zebra Celebrations. I used my daughters’ old table from IKEA. I put a red Christmas tablecloth I bought at Walmart years ago. 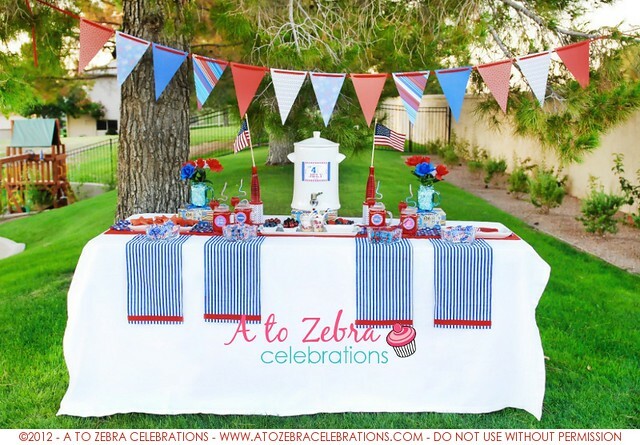 I made the little table runner with the stripes fabric from Goodwill. I bought paper plates, napkins, and 4 apple juice boxes at the Dollar Tree. Total for this $4. I wrapped each juice box with scrapbook paper. 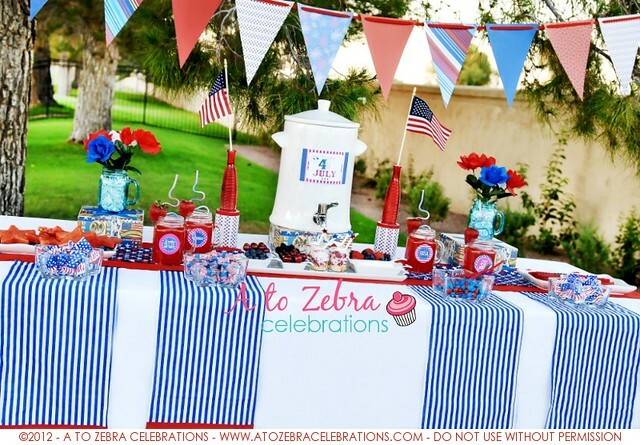 The little pinwheels inside the red jar in the middle of the table are from Michael’s $1.20 with the 40% off coupon. 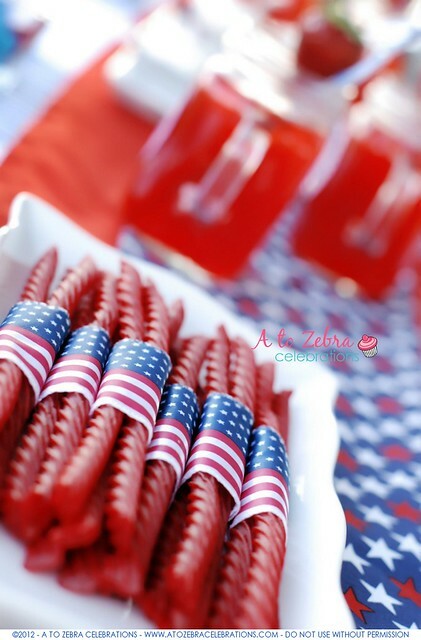 I wrapped the red chairs with the “flag” ribbon from my 90% off purchase at Hobby Lobby last year. All the little tags, signs, and party circles are a FREE download from Paper & Pigtails etsy shop. 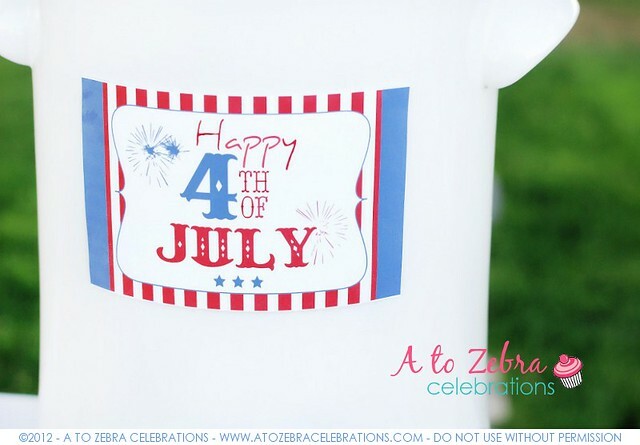 You can download them here: http://www.mediafire.com/file/5oq3itg8jbfkkcw/July4thPrintables.zip. Total for this party was less than $80. However, I didn’t spend this much because I already had many things in hand. This total is for someone that practically has to get everything except the tables. If you are buying tables, then you will go over this amount. I suggest to borrow from friends/family if you need to. Walmart, Goodwill, Target and garage sales are the best places for white dishes. The stunning pictures are a courtesy of Jamie Lynn Photography. You need to check out her website! She’s so talented. Thank you so much, Jamie! 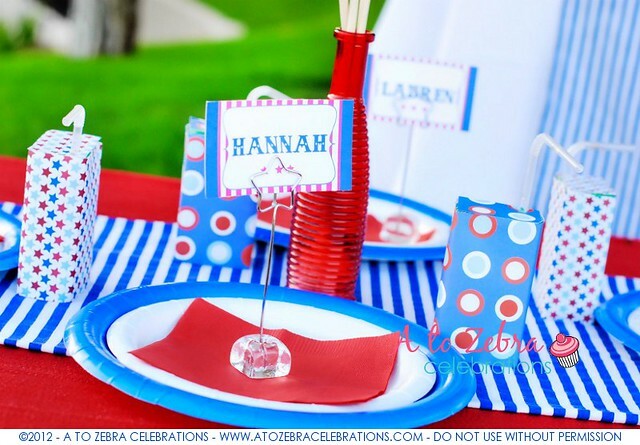 Love your party table, especially all of the detail! Another amazing display! Tons of motivation here! 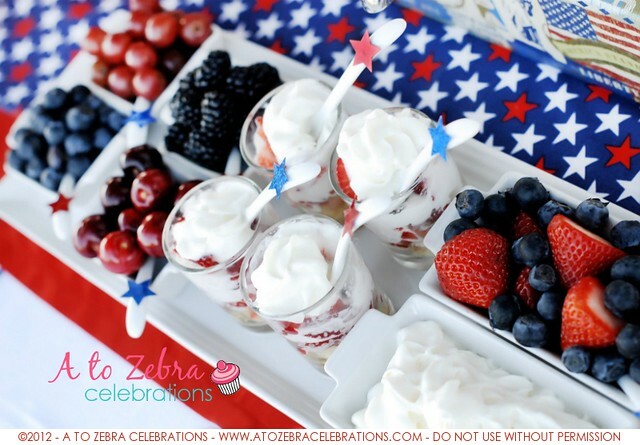 Beautiful!You gave me ideas to do my 4th last minute party! Thanks! Awesomatic job chica! And the fact that you did it on a dime makes it even more fabulous! Wow, this is amazing! It's gorgeous! Wow! 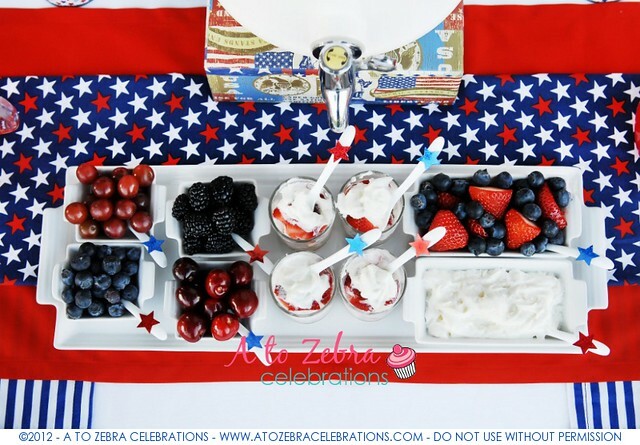 What a fabulous 4th of July set up! I also love the Dollar Tree! So beautiful party!! Thank you for this post!! 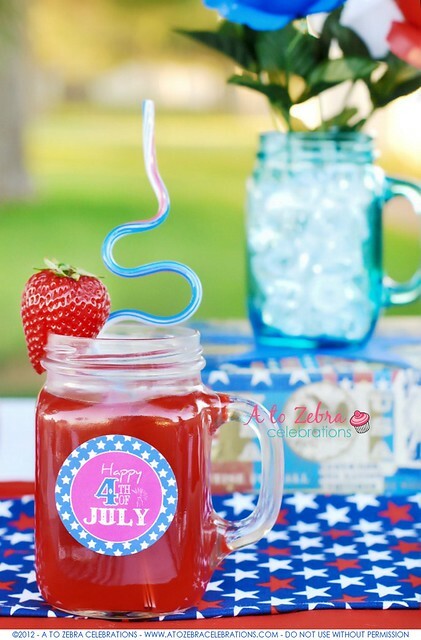 It doesn't get better than cute AND affordable! I love this post! Thanks for breaking down all your thrifty details!